Box Text: ERADICATE THE ROOT OF EVIL. The year is 2017, and an evil entity has spread from the servers of a popular video game into every day life. The danger is real. You must vanquish the evil at any cost. New weapons. New allies. And new fighting abilities might not be enough. What would you sacrifice to save the world? Exciting and innovative storyline in a simulated MMORPG! 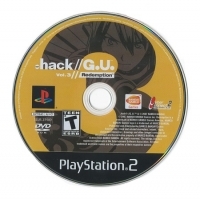 Use save data from .hack®//G.U.™ Vol.2: Reminisce™! Includes the sixth episode of the hit anime .hack//ROOTS! 07-26-2015 egen Box Text ERADICATE THE ROOT OF EVIL. The year is 2017, and an evil entity has spread from the servers of a popular video game into every day life. The danger is real. You must vanquish the evil at any cost. New weapons. New allies. And new fighting abilities might not be enough. What would you sacrifice to save the world? Exciting and innovative storyline in a simulated MMORPG! Fierce Real Time Fighting! Powerful Customizable Weapons! 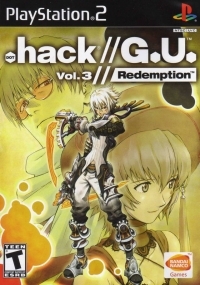 Use save data from .hack®//G.U.™ Vol.2: Reminisce™! 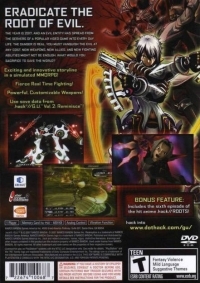 BONUS FEATURE: Includes the sixth episode of the hit anime .hack//ROOTS! 10-27-2013 teck Box Text Eradicate the Root of Evil. The year is 2017, and an evil entity has spread from the servers of a popular video game into every day life. The danger is real. You must vanquish the evil at any cost. New weapons. New allies. And new fighting abilities might not be enough. What would you sacrifice to save the world? 03-22-2012 scott Box Text Eradicate the Root of Evil. The year is 2017, and an evil entity has spread from the servers of a popular video game into every day life. The danger is real. You must vanquish the evil at any cost. New weapons. New allies. And new fighting abilities might not be enough. What would you sacrifice to save the world? 11-21-2011 scott Box Text Eradicate the Root of Evil. The year is 2017, and an evil entity has spread from the servers of a popular video game into every day life. The danger is real. You must vanquish the evil at any cost. New weapons. New allies. And new fighting abilities might not be enough. What would you sacrifice to save the world? 09-28-2011 kaizlu Box Text The year is 2017, and an evil entity has spread from the servers of a popular video game into every day life. The danger is real. You must vanquish the evil at any cost. New weapons. New allies. And new fighting abilities might not be enough. What would you sacrifice to save the world? This is a list of VGCollect users who have .hack//G.U. Vol. 3//Redemption in their Collection. This is a list of VGCollect users who have .hack//G.U. Vol. 3//Redemption in their Sell List. This is a list of VGCollect users who have .hack//G.U. Vol. 3//Redemption in their Wish List.